The “Global Industrie Awards” is the first major event in France dedicated to the entire manufacturing sector. 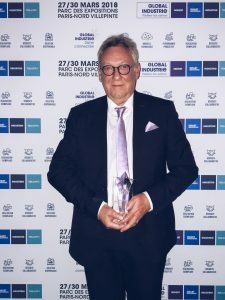 The awards were presented on the evening of 27th March 2018 in Paris. The ceremony was attended by the press and many manufacturers, reflecting the diversity and modern nature of the manufacturing sector in France. Bricsys, supported by CatalCAD (our BricsCAD Authorized Reseller in Grenoble, France) won the “Productive Performance” category of the Global Industrie Awards for BricsCAD V18. This award is dedicated to innovations that provide significant gains in productivity, key ratios, or engineering performance. BricsCAD V18 Platinum combines the power of direct modeling with 3D constraints and parametrics. This combination gives mechanical designers the modeling freedom and the precision needed to create complex mechanical parts and assemblies. Bricsys represents the future of the .dwg format, with comprehensive workflows for general design, mechanical design and BIM. All of these workflows are available in one product, based on .dwg – the industry standard file format. Great News! pleased to hear. Congratulations to Erik and all the Bricsys staff! Customers in Canada truly like BricsCAD for Mechanical design! Congratulations!